Today I am going to be talking about sugar and the 4 types of sugar that can affect other people. I am going to be show you guys a Google presentation slide of what we and my buddy 'Alo' just finished on. This will help people to eat the right sugar and reducing some of the percentage of fat to help people reduce weight. I am going to show a slide tittle called 'What is refined sugar?'. This slide shows a question about 'What is brown sugar?'. Many sugars have different kind of colour and it may affect the percentage of fat. But white sugar has almost a lot of fat but Less high of carbohydrate. 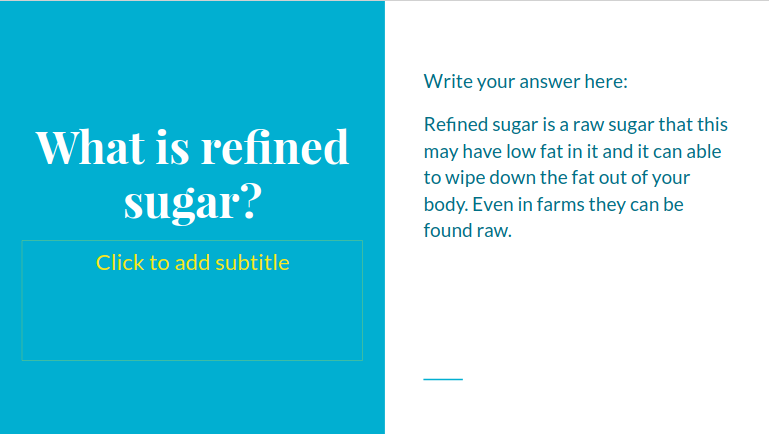 This is what I wrote on the right side of the slide, 'Refined sugar is a raw sugar that this may have low fat in it and it can able to wipe down the fat out of your body. Even in farms they can be found raw sugar.' 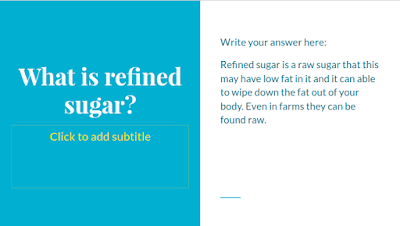 What I mean by raw sugar is that some of the people in our countries like raw sugar because it has low fat inside. But for most of the people like white sugar because they describe it has great colour but a lot of fat. The sugar film has one of the tester that test the sugars from foods and drinks is 'Damon'. He has been eating sugar for years in other countries and went to see people that had sugar. And also this film is a documentary which is true.